This is such a perfect, easy to make ‘bring a plate’. Not only will it appeal to even the fussiest kids, it suits most dietary intolerances (being egg, nut, dairy and gluten-free). Don’t be put off by the avocado. My kids both dislike avo but love this decadent chocolaty treat. Bonus points – even toddlers can help make this and older kids can easily handle making this from start to finish! In a high-speed blender or food processor, blend the raspberry sauce ingredients until liquidised. Set aside in a small bowl or jug. Without washing the blender, add all of the mousse ingredients and blend until smooth. You can vary the amount of sweetener to suit your own taste (I’d use the half cup for a school party though). Divide between little cups, top with the raspberry sauce and refrigerate for 1 hour or more. Served chilled. 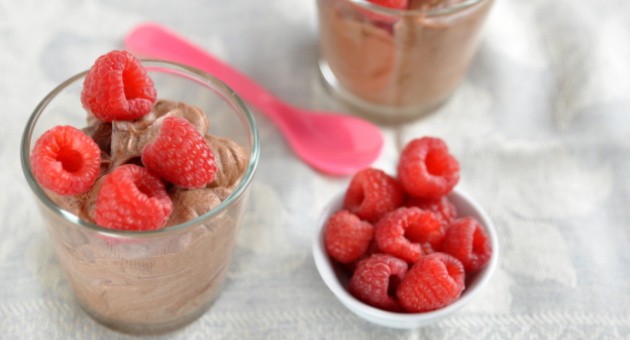 Note: this mousse also makes a fabulous ganache for icing cakes.